Nickname(s): "Your Gateway to the East"
"Information Technology Capital of the Province of Rizal"
"Bibingka Capital of the Philippines"
The Municipality of Cainta (Filipino: Bayan ng Cainta) is a first-class urban municipality in the province of Rizal, Philippines. It is one of the oldest (originally founded on August 15, 1571), and has a land area of 4,299 hectares (10,620 acres). 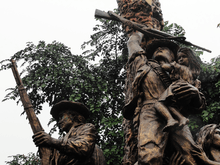 Cainta serves as the secondary gateway to the rest of Rizal province from Metro Manila. With the continuous expansion of Metro Manila, Cainta is now part of Manila's conurbation, which reaches Cardona in its westernmost part, and is therefore one of the most urbanized towns. With a population of 332,128 inhabitants per the 2015 census, it is currently the second most populous municipality in the Philippines (after Rodriguez, Rizal), although there are efforts underway to convert it into a city. Its income of Php 1,251,517,325.79 makes it the richest municipality in the country. In 2016, the National Competitiveness Council awarded Cainta as the Most Competitive Municipality (1st & 2nd Class) in the Philippines. It was also awarded with 1st Place in Infrastructure, 1st Place in Government Efficiency, and 2nd Place in Economic Dynamism. To help spread the faith, several Augustinian friars were commissioned by Spain and were among the ship's passengers. One of them was Father Alonso de Alvarado, who had been in the armada of Villalobos. Another was Father Agustin de Albuquerque, who became the first parish priest of Taal town, south of Manila. Some of the missionaries were sent to Cebu province in the central Philippines to accompany Father Martin de Rada the Prior. Four stayed to work in Pampanga province and the environs north and south of Manila, which included the then-village of Cainta.. In 1913, under the American rule, Cainta and Angono were consolidated with Taytay as one government entity. On January 1, 1914, it once again became an independent municipality and remained so to this day. Cainta is one of fourteen (14) municipalities of Rizal Province after the inclusion of other towns of what are now referred to as Antipolo, Angono, Binangonan and Taytay. In 1942, Japanese Occupation troops entered Cainta. In 1942 to 1944, local guerrilla groups of the Hunters ROTC was the four-year main invasions in Cainta against the Japanese, when the guerrillas was they retreating by the Japanese before the liberation. In 1945, local Filipino troops of the 4th, 42nd, 45th, 46th, 47th and 53rd Infantry Division of the Philippine Army and 4th Infantry Regiment of the Philippine Constabulary was started the liberated and captured in Cainta and helping the guerrilla resistance fighters of the Hunters ROTC Guerrillas to fought against the Japanese and ended World War II. During World War II under the Allied Liberation, the some of all stronghold of local Filipino soldiers of the Philippine Commonwealth Army 4th, 42nd, 45th, 46th, 47th and 53rd Infantry Division and the Philippine Constabulary 4th Infantry Regiment was sending the local military operations and liberated in all municipal town of Cainta and aided the local guerrilla groups of the Hunters ROTC Guerrillas against the Japanese Imperial armed forces and begins the Liberation of Cainta on 1945 and arrvial by the American liberation forces enters the town. In late 2003, former Cainta mayor Nicanor Felix, with the rest of its Sannguniang Bayan members, unanimously approved a resolution for Cainta's cityhood bid. On that same year, on its annual fiesta, the Municipality had its theme "Cainta: Lungsod 2004", promoting its bid for cityhood. However, in January, 2010, current Rizal Governor Jun Ynares III now pushes the cityhood of Cainta and Taytay, due to the overabundance of jobs, amenities, and its people. According to the 2007 census, it has a population of 304478 (see above). Its population consists of 70% Roman Catholic Christians, 15% Non-Catholic Christians (including Iglesia ni Cristo, Ang Dating Daan, Aglipayan, Jesus is Lord, and others), 10% Muslims, 3% Chinese Buddhists, and 2% Sikhs. The people of Cainta are mostly Tagalog-speaking Filipinos. The main road of Cainta is Ortigas Avenue Extension, a heavily congested corridor that passes through the business district of Ortigas Center and leads to Mandaluyong City and San Juan in the west and the town of Taytay and Antipolo City in the east. Another major road is Francisco P. Felix Avenue (formerly known as Imelda Avenue) which runs across Ortigas Avenue Extension and connects the town to Marikina City to the north and Taytay to the south. The point of intersection between these two main arterials is known simply as Junction. A. Bonifacio Avenue, located in the town proper, is the town's most frequently traversed street. Traffic enforcers make their best to weaken the traffic situation in the areas of Junction, Karangalan, Parola and Brookside but the presence of these provided only minimal solution. At the current time, Cainta is under the management of the MMDA, which pertains to the traffic situations, particularly in the Junction area. Cainta has a robust economy as evidenced by several commercial and industrial establishments that have sprouted. Cainta is the richest municipality in the country with respect to Income Revenue growth. (based on 2010 COA Report). The town continues to attract businesses because of its proximity to Manila and the town's burgeoning population which mostly consists of hard-working and hospitable people. Cainta is the "richest municipality in the Philippines as evidence of numerous manufacturing firms here like Mitsubishi Motors Philippines, the largest car manufacturer in the country, the Monde M.Y. San Corporation, one of the nation's leading biscuit manufacturers, BF Construction Philippines, Ford Philippines, Motortrade Philippines, Fortune Tabacco Corporation, Honda Cars Philippines, Hyundai Cainta, Rockbuilt Manufacturing Corporation, Cathay Pacific Steel Corporation, South Pacific Chemical Industry, The House Printers Corporation, and more. Cainta Junction - A major intersection, often referred to as traffic tambayan by the locals, adjoins the Metropolitan Highways [Felix (Or Imelda) Avenue at the North, A. Bonifacio Avenue to the South, and Ortigas Avenue on its East and West Bounds]. The busiest and a critical point where it connects Metro Manila and the rest of the Rizal province. The Cainta Municipal Hall - when the old municipal building (located at the current Town Plaza) was destroyed by a fire, then-Mayor Benjamin Felix called the attention of the Provincial Government to build a new one at a lot in Rosepack Subdivision. it was finished in 1995. Our Lady of Light Parish - standing firmly as one of the most beautiful and oldest churches in the province, it is erected upon the directives of Fr. Gaspar Marco, S.J. in 1707 and was finished by Fr. Joaquin Sanchez in 1715. Upon its elevation into a Parish in 1760, this church is renovated many times because of heavy rains and earthquakes. In 1889, this church was destroyed during the Filipino-American war, leaving only the adobe wall surviving. A mural depicting the patroness of the town, painted by national artist Fernando Amorsolo, has replaced the image ravaged during the war. This image is currently placed on the left side portion of the Church's main altar. On 1966, a reconstruction of the church emerged upon the initiative of Cardinal Rufino Jiao Santos. It was solemnly blessed on February 25, 1968. On December 1, 2007, during the official town fiesta, a Historical Marker was installed by the National Historical Institute on its facade, coinciding with the celebration of the third centenary of the construction of the Church. The current parish priest is Rev. Fr. Neil Vincent M. Tacbas. Krus Sa Nayon,Inc. (KSNI) was established as early as 1900 during and after Spanish era. The group was also known for its extravagant preparation and passion play every night of the Holy Week period. The KSNI cenakulo play was previously held at the Jaika Compound beside the municipal building and Francisco P. Felix Memorial National High School. To date, the play is held at the stage beside the municipal ground,alongside the One Cainta Police Headquarters and One Cainta Fire Department. On Good Friday, the town witnesses a yearly depiction of the station of the cross in the crucifixion of Christ. A devotee, in hopes of being absolved from sin plays the role of Christ and voluntarily sacrifices himself to be flailed and whipped and be "nailed" on a cross, although most of the wounds are shallow and superficial. This spectacle might seem barbaric to a foreigner, however it has been a long-held tradition accepted by many of the inhabitants not only of Cainta, but of other parts of the country as well. This is held by 10 different groups at the Liwasang Bayan (town plaza) and in other parts of town. Cainta also has a photographer's group C.A.P.E. (Cainta Association of Photography Enthusiasts). It was established during the Holy Week of 2012 in which the group's aim is to promote the historical and cultural heritage of the town. In past decades Cainta had been suffering a lack of potable surface water supply, with only deepwell water source available. Today, almost the entire municipality of Cainta is supplied 24 hours a day with potable water from the Manila Water Company Inc.,MWSS concessionaire for East Zone, along with several towns in Rizal Province. Cainta is primarily served by PLDT, Digitel, and BayanTel. Mobile carriers, SMART, Globe and Sun Cellular also cater Cainta's mobile communication needs. Cainta is also covered by GSM & 3G network while portion of it is covered by LTE (telecommunications) of SMART. Globe is in process of upgrading its LTE coverage. Innove Communications Inc., a wholly owned subsidiary of Globe Telecom, has expanded its telecommunications and broadband services throughout the province including the Municipality of Cainta. It empowers the town with several options to get connected to the internet fast and reliable. This also includes the roll-out of WiMAX technology upgrading the link of the municipality to the Cyberspace. Internet access is a vast necessity across the town, and Wi-Fi is readily available through Malls and internet cafes in Cainta. Lately, Cainta was included along with several town/city in the province to pioneer the latest 4G Mobile Technology, preparing Cainta to the next generation wireless connectivity to the world. Major Cable TV providers are available in Cainta; Sky Cable (thru Sky Cable CAMANAVA & Rizal) covers the entire municipality. Now several cable providers are bidding entry to Cainta. This includes Cablelink serving the Sto. Domingo and San Isidro area and Destiny Cable covers areas along the boundary with Pasig. His Little Ones Learning Center, Inc. Morning Dew Montessori School, Inc.
↑ "Official City/Municipal 2013 Election Results". Intramuros, Manila, Philippines: Commission on Elections (COMELEC). 11 September 2013. Retrieved 24 October 2013. 1 2 "Province: RIZAL". PSGC Interactive. Makati City, Philippines: National Statistical Coordination Board. Archived from the original on 29 October 2013. Retrieved 24 October 2013. 1 2 3 4 "Total Population by Province, City, Municipality and Barangay: as of May 1, 2010" (PDF). 2010 Census of Population and Housing. National Statistics Office. Archived from the original (PDF) on 29 October 2013. Retrieved 24 October 2013. ↑ "General Infos... - James Frank Ampil Olaño - Facebook". ↑ http://pragmaticmates.com, Pragmatic Mates s.r.o. -. "CISI - Cablelink Internet Services Inc.". ↑ "Welcome to Divine Angels Montessori". 1 2 "Greenland Academy – HOME OF EXCELLENCE". 1 2 "Security Check Required". 1 2 "Account has been suspended". 1 2 "St. Francis Cainta - Education with Love and Concern". ↑ "CSJPII.EDU.PH - College of Saint John Paul II Arts and Sciences".